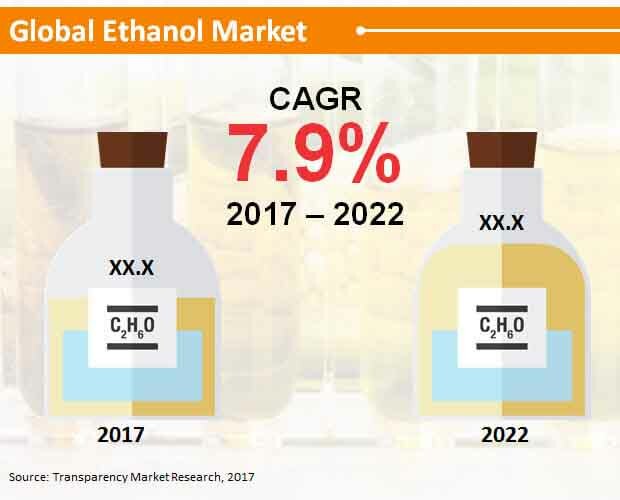 The rapidly growing demand from the alcohol industry is driving demand in the global ethanol market. The rising population that is open to consuming alcohol is stimulating growth in the global ethanol market. Further, there is immense need for variety in the alcohol industry. At the same time, ethanol is highly consumed due to its good sterilizing properties. These aspects augment growth in the global ethanol market. It helps hospital staff maintain microbes-free environment and is ideal for use in labs. Equipment are sterilized with ethanol before using to culture microbes obtained from human sources. As the need for diagnostic tests increase, the demand for the product in the global ethanol market will also rise. The global ethanol market is known for its perseverance to sustain growth and demand in challenging situations. Ethanol producers in chief locations such as the U.S. remained unaffected when the Organization of the Petroleum Exporting Countries (OPEC) strategized to snuff out competition which halted the nation’s prominent boom during the time. However, U.S. producers were still able to reach to new heights of success. In another instance, the ethanol sector continued to adopt new technologies and innovate despite the mismanagement of the renewable fuel standard (RFS) that created uncertainty. In this report, the analysts explain some of the crucial factors of the global ethanol market that could prove to be important for ensuring a lasting progress in the industry. From segmentation to vendor landscape, the report offers a detailed study of critical aspects of the market. Buyers of the report are expected to receive a comprehensive guideline that could lead them to their peak success when operating in the market. The world ethanol market is prophesied to be strong against tough conditions that could paralyze its growth. Despite challenging production economics due to low oil prices, ramping up of opponents against the RFS, and uncertainty because of regulatory indecision, the market survived pretty well in 2015. The year showcased the resolve and strength of the ethanol sector. Producers were able to ride out the storm with the help of the indispensable value of ethanol as a low-cost, clean octane booster and thriving export demand. In the U.S., millions of metric tons of high-protein animal feed and billions of gallons of high-octane renewable fuel were produced in ethanol bio-refineries of several states. The international ethanol market is forecasted to be classified according to two classes, viz. type of feedstock and end use. As per the classification by feedstock, the market could see a segmentation into coarse grain-based, sugarcane-based, and wheat-based ethanol. Although there could be different markets for ethanol in terms of feedstock type, one is expected to garner a larger share in the coming years. The analysts foresee the market to be dominated by coarse grain-based ethanol, which represented a 53.0% share in 2017. On the basis of end-use segmentation, the international ethanol market is predicted to be segregated into fuel, industrial solvents, beverages, and cosmetics. Regionally, North America could set the tone for a staggering growth in the international ethanol market while collecting a revenue of US$48.3 bn by the end of 2022. Another attractive region for the market is prognosticated to be Europe. However, there could be other geographies such as Japan showcasing a slower growth in the near future. Asia Pacific except Japan (APEJ) and the Middle East and Africa (MEA) drew a greater revenue than Japan in 2017. The competition in the worldwide ethanol market is elaborately explained in the publication while profiling key players such as Archer-Daniels-Midland Company, Cargill, Incorporated, Solvay Group, Mitsubishi Chemical Corporation, Pacific Ethanol, Inc., Green Plains, Inc., The Andersons, Inc., Valero Energy Corporation, POET, LLC, and Flint Hill Resources LP.